Chocolate Caramel Brownies are a luscious, rich concoction with a brownie base, topped with pecans, caramel, and chocolate. In a word they are amazing. 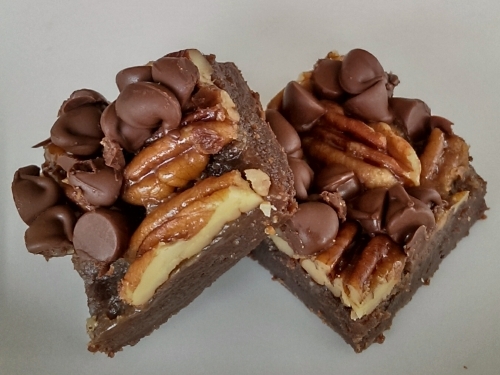 The bars are a version of Turtle Brownies or Turtle Cookies, so named after the original candy which featured a whole pecan, drizzled with caramel and then covered with light chocolate. The creased pecan back resembled a turtle shell, its grooves accented by the caramel and chocolate. This brownie is layered with chocolate on the bottom, followed by pecans and caramel, and topped with one more coating of chocolate for good measure. Preheat oven to 350º F (325º F for a glass dish). Lightly grease a 13 x 9 baking pan. In a small saucepan on low heat, melt ½ cup butter or margarine together with unsweetened chocolate. Set aside. In a medium bowl using an electric mixer on medium speed, beat eggs until frothy and light. Add in sugar, salt, and vanilla extract. Mix until well blended. Pour in chocolate mixture. Blend until batter is smooth. Add flour, a bit at a time, scraping the bowl constantly until well combine. Pour mixture into prepared pan. Bake for 15 minutes. Meanwhile, prepare caramel syrup for topping. In a medium saucepan on low heat, melt 1 cup butter or margarine. Add brown sugar. Mix together. Allow syrup to cook slowly, barely bubbling, until brownie layer is finished baking. Remove pan from oven. Sprinkle with pecans. Gently pour caramel syrup over pecans, covering brownie surface completely. Bake brownies for 15 minutes more. Remove the pan from the oven. Sprinkle surface with chocolate chips. Return the pan to the oven for exactly one minute. Remove brownies from the oven and allow them to cool completely on a wire rack. Cut into bars. Store bars loosely covered at room temperature. As you prepare Chocolate Caramel Brownies, you may choose to melt the butter and chocolate for the brownie layer in the microwave, rather than on the stove top. To do so, set the butter and chocolate in a microwave-safe dish. Cook for 20-30 seconds on high. Stir the mixture. Repeat the process until the butter and chocolate have melted and are thoroughly mixed together. Do not overcook. Pumpkin Cream Cheese Brownies: they're a swirl!